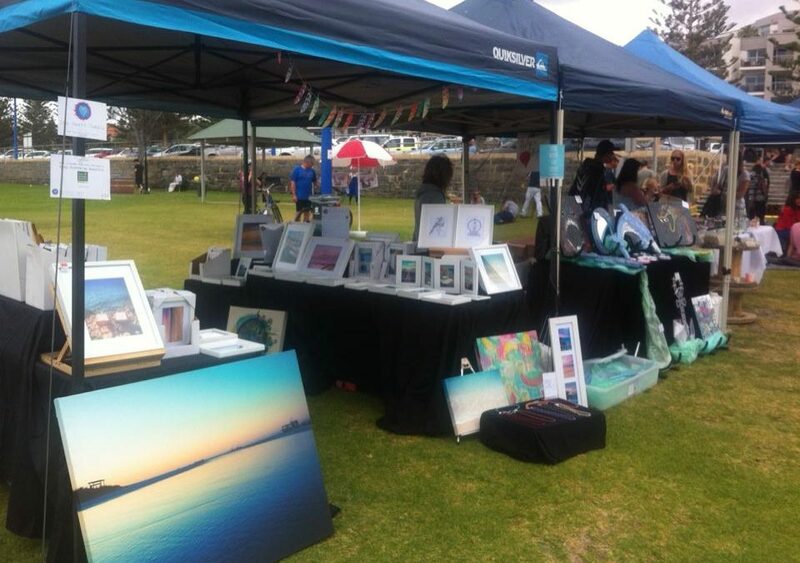 In recent years Perth has really embraced the market scene, with hundreds of thousands of people attending outdoor events that showcase all the wonderful creative products of our local artists. Maybe its the (relatively) clean air, the spectacular beaches, or the 300 days of sunshine that we are blessed with that propels our art, but one thing is for sure and that is that Perth has a thriving community of creative souls. As mentioned, most markets in Perth are outdoors. These are by far my favourite types as I LOVE being outside. Put me near the beach or bush and I’m one happy market stall camper! Most markets will set you back $60 to $90, with the bigger festivals anywhere from $100 to $200. I steer away from any organisation charging more than this as I believe it is ludicrous to ask such high fees, especially when their reach is less than 5,000 people. The bigger festivals will pull over 30,000, and these events have proved to be a whole bunch of fun and very worth my while. It can seem daunting to begin with all the costs involved, but if you love what you do, cant stop creating and would love to make a living from you art, then this is a wonderfully challenging and rewarding path. I put myself through the ringer in the early days, questioning my worth, my ability, my talent if any at all. And slowly, as part of the integration of self, I pushed through it, kept going and hardened my skin in the process. I realised that even though I thought I needed external approval for what I do, it wasnt what I was really looking for. All along I needed it from myself. But thats a whole other post! So, if you have decided that you want to enter the market stall circuit, here are a few things you will need. -Bed sheets or table cloths to throw over the table to hide all the extra stock/boxes you’ll put underneath. -A portable till (make a float of around $200 with a combination of notes and coins, a calculator, ledger book, pens, receipt book in case peeps want a tax receipt). -A way to display your work. Simple stands, shelving, tiered looks best. I use veggie boxes turned upside down with a black sheet thrown over the top, and some handy shelves my clever Grandpa made me years ago. -For shelter, most stall sizes in Perth are 3m x 3m, so you will need a tent to span this area. I brought my tent from BCF. If you’re going to be out in the elements you will eventually need to get weights (also from BCF) to hold the thing down in strong wind. Also ‘sides’ so you are protected from sun/wind/rain somewhat. -A chair for you to sit on and things to keep you occupied, a book to read, stuff to draw on etc. Facebook is where I hear about most events. A good facebook group to join is https://www.facebook.com/groups/perthfoodandmarketstalls/ where organisers will regularly post call outs for stall holders. I love seeing artists thrive and Im happy to help answer any questions you may have, just shoot me a line and I will gladly help out anywhere I can! Get new posts, updates, deals and delights infrequently! Enjoy this blog? Share it round!